As we begin a project with a client, whether it be a new build or renovation, the Foyer entry design is always the heart of the conversation. It is the first space that welcomes your friends and family - and is the space that provides the first impression and feeling for your guests. I've taken some of the most inspiring Foyer designs over the past few years that encompass the art of natural and interior architectural details to a beautiful standard. Throughout each of the designs, I am drawn to the the contrast of materials, pops of green, and sculptural elements that begin to tell a different story as you enter through each home. The founder of the hottest brand in ice chests, Roy Seiders, keeps it low-key in his Austin home. Roy and his wife, Kathi both express "“The thing that was most important to us was having a welcoming home." Designer Emily Seiders and Architect Ryan Street knocked this entire project out of the park - incorporating the clients' love for everything timeless, comfortable, durable, and of course their love for the outdoors. An up close encounter with texture, scale, and juxtaposition in this Austin home, featuring rectangular mirrored sconces flanking a serene, clean abstract piece, over a large rooted console and simple accessories. Realizing this look and aesthetic isn't for everyone, but it speaks to me in regards to the power of simplicity and achieving a simple, yet powerfully stated entrance. A Florida 20-acre estate surrounded by live oaks and royal palms, encompasses this plantation home whose property provides as a foster farm for their owners' rescue horses. Designer, Marlene Murrah shares that the owner wanted a comfortable home without formality - clean and transitional. French oak flooring lays the foundation for a soothing monochromatic palette of taupe, gray and linen warmed by touches of vanilla and cognac throughout. The couple accessorized with their existing art and antiques, such as a Regency amboyna table, an 18th-century Italian bench and the porter’s chair in the formal living room. Luxe Magazine A Contemporary Jupiter Retreat with Tropical Southern Charm. An indescribable presence, and project in of itself as an entirety. If you have yet to browse this beautiful project by Mark D. Sikes, you are in for a treat. Mark's work sets the tone for everything that is classic, but refined and made more beautiful through his perfection of layers, patterns, textures, uniquely tailored consoles, lighting, and fine tuned thoughtfulness when it comes to furniture placement and detailed design. A true American farmhouse - In Texas, by Joni Webb of Cote de Texas blog - writes about the 16,000 square feet country house located about half an hour from Houston. Joni showcases the beautiful home designed by Curtis & Windham Architects and built by RB Ratliff Builders. Interior designer, Ginger Barber incorporates beautiful stone flooring in the entry and stair hall, with dark hardwood floors throughout the rest of the home. 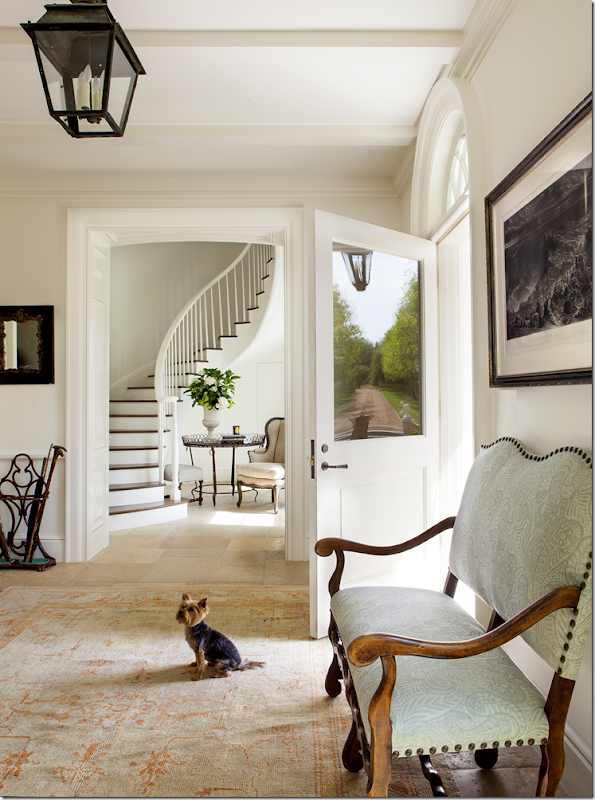 Besides the adorable pup in this entry way, I am always drawn to incorporating some type of green pop, upholstered pieces, and appropriate light fixtures for the right balance of warmth and function. Cote de Texas Blog : A True American Farmhouse - In Texas! We visited a job site this morning for a complete Foyer facelift, also incorporating the Dining and the Formal Living Rooms directly off their main hall. We so look forward to sharing this project in the near future, as well as our Old Town renovation project in our next post that incorporates a completely different look for a historical home off Lee Street in the very heart of the Historic district.